It would appear that the Ontario Conservative Party's support for right-to-work legislation is costing them support and costing them candidates. Ontario Conservatives are concerned how the labour policy messaging is looking. Forum -- grain of salt alert -- shows support for the Ontario Conservatives down. You can read the Wikipedia entry to find out what right-to-work legislation is. It essentially allows a new employee to bypass membership in a union, but benefit from any gains made by a union agreement negotiated with the employer. The idea being - as new employees join and are perhaps encouraged to opt out of union membership, the union's strength will be diluted, favouring the employer in collective bargaining. While not myself a union guy, it's pretty transparent what this law is attempting to accomplish. Unions typically advocate against Conservative legislation. Therefore, unions are a natural target for Conservative legislation. What the Conservatives have failed to take into account is the level of support they get from labour. For reasons that escape me, labour also vote Conservative - likely due to the Conservative Party's false "blue-collar" appeal. As a result, candidates in labour-heavy ridings are reluctant to jump on board the anti-labour movement. 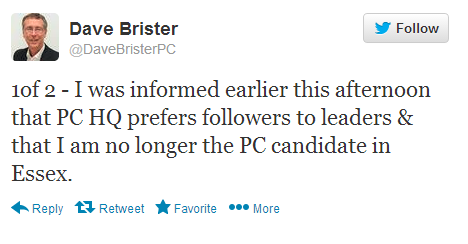 First, the party fired Dave Brister over his public opposition to the policy. Now, two Hamilton-area Conservative candidates have resigned. They "say they are stepping down for personal reasons and they support [Conservative leader Tim] Hudak and the party's policies." Hamilton. Brister dumped because of opposition to right-to-work. Two candidates. I did, however, find this YouTube video created by Jesse Cullen asking Mr. Ouellette for his thoughts. It didn't look like Mr. Ouellette was prepared to comment. There's no question this plays to the Conservative elites, but it appears it's not trickling down to the masses nor is it resonating with Ontarians.